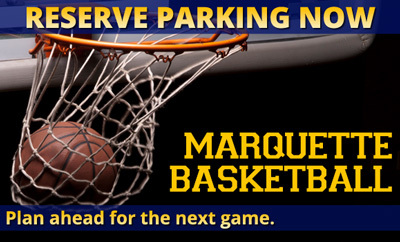 Parking.com has convenient parking for all Marquette Golden Eagles men's basketball home games played at Fiserv Forum. Refer to the map for more information on game day parking or to reserve a guaranteed space. Marquette currently competes in the Big East Conference. The team maintains rivalries with several other schools, including the University of Wisconsin–Madison, University of Louisville, University of Notre Dame, and DePaul University. 822 N Old World Third St.